Doing some research into the best wedding dress fabrics for your gown? Organza this, taffeta that – it all feels a bit like studying for a school vocab test… So to help you out, here’s a cheeky little cheat-sheet introducing the different fabrics our designers use to create each unique bridal wear creation. 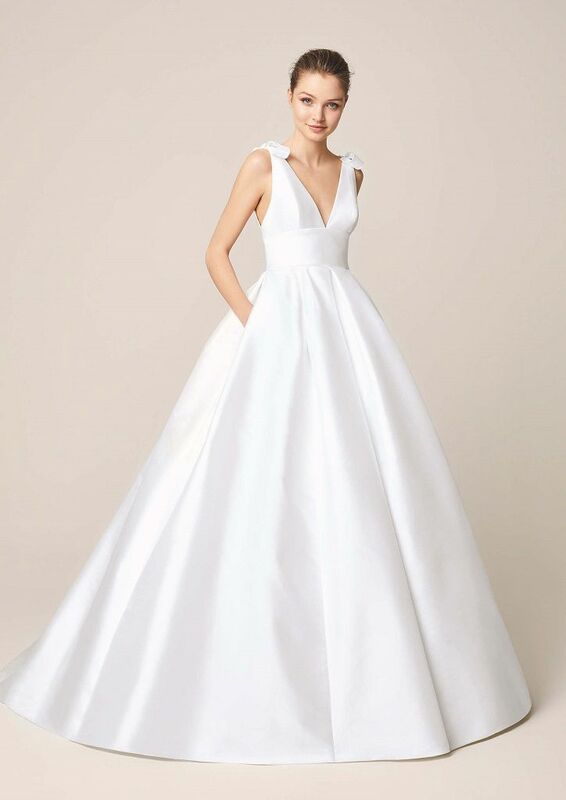 Which wedding dress fabric is best for me? First up, your choice of wedding dress material will be important depending on the time of year you’re getting married. A beach wedding in the tropics will need a very different combo of fabrics to a winter wedding here in the Peaks, that’s for sure! That’s why we’ve split our fabrics run-down below into summer and winter seasons to make the whole process that little bit easier for you. 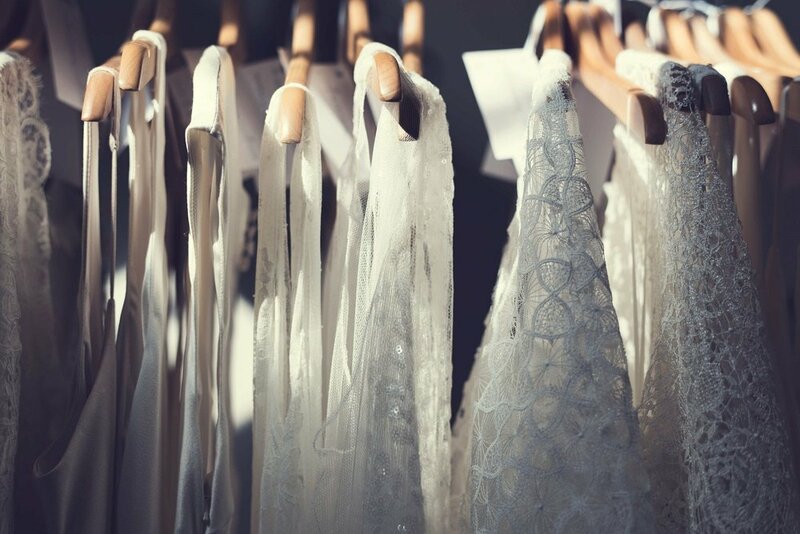 Of course, the very best way to discern the right material for your bridal gown is to come to the boutique and try on some different fabric options and see how they work together. Or you can always drop me a line with any questions you have about our range of designer bridal dresses. For any total bridal newbies out there, the easiest way to describe wedding dress materials is to split them into two categories: composition (what the gown is made of) and fabric (how it’s made/finished). How these materials work together will determine the finished look and feel of your dress on your wedding day. So you might go for a satin dress with a tulle overskirt, but the entire outfit is still made completely out of silk. In this example, silk is the composition, and satin and tulle are the fabrics. All good so far? Phew. The gold standard of wedding dress materials, and the most expensive. Made from the cocoons of silkworms, but a lot nicer than that sounds! As you’d expect, cotton has a light and breathable weave that is perfect for beach weddings or summertime ceremonies. Woven from flax, linen is even more lightweight than cotton so it works well for hot and humid wedding-day weather. Just watch out for wrinkles! It used to be a bit of a dirty word in designer bridal wear, but synthetic isn’t necessarily a bad thing these days. Far from it. In fact, some forms of polyester are so good now that they’re barely distinguishable at all from real silk. These blends are especially popular with modern bridal designers as they give you the true luxury of the purer materials together with the durability and peace of mind that come with man-made fibres. Now let’s move onto the specific types of wedding dress fabric. (Here come the fancy words!) We’ve organised the list by summer/winter season to make things easier. Soft, sheer and see-through, chiffon is the simplest of the softer wedding dress fabrics. You’ll often see it layered (or overlaid on top of other fabrics) for that floaty boho wedding dress look. Think ballerinas’ tutus, or net curtains (nice ones, mind!). 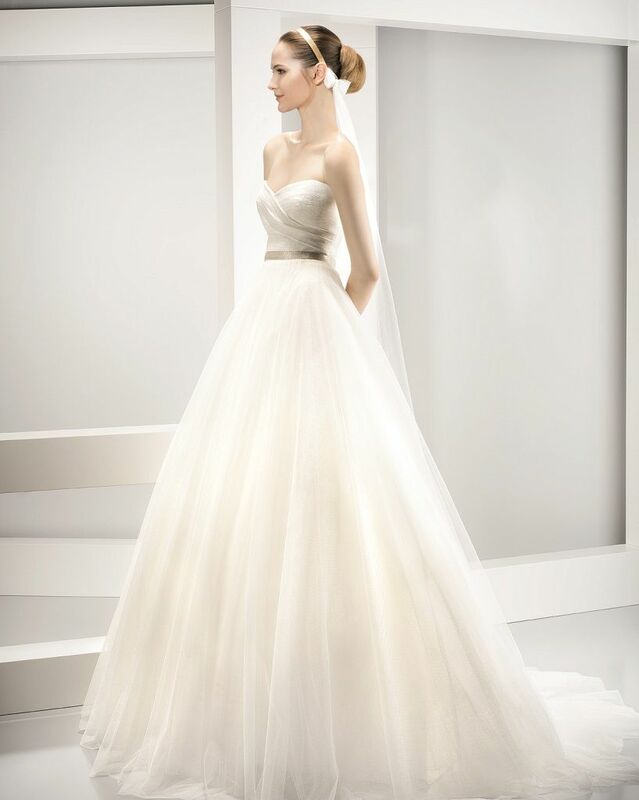 Tulle is the open weave fabric that gives an airy and delicate touch to a wedding dress. Stiffer than chiffon, and ideal for giving some real volume and big-day pop to the finished look. Like a tauter, more structured version of chiffon. Holds its shape better than chiffon as a result, but still with a bit more flow than tulle. Often used in bridal veils, trains and overskirts. Like a slighter, summerier version of satin (see below) due to its lighter weight and crisper feel. The most structured of the fabrics used in the gowns in our boutique (Jesus Peiro love a bit of mikado). Ideal for winter weddings thanks to the blend of silks incorporated by the designer. These raised designs with a Jacquard weave deliver a very ornate and classical effect to a wedding dress. More associated with autumn or winter wedding gowns. That classic sheen you expect to see on a wedding dress? That’s the satin finish. As well as its signature lustre, satin also gives a more structured or formal look because of its natural weight, making it a go-to choice for weddings in cooler weather. For summer weddings, lighter, stretchier satins are the way to go. Light, soft and thin, crepe is best known for its subtly crinkled or crimped surface and its elegant figure-huggability. (That’s a word, right?) There's also crepe de chine, which is a thinner form of crepe, somewhere between crepe and chiffon. Charlie Brear use crepe to great effect in their bias-cut dresses, offering a flattering shape and line but still with enough weight not to be overly revealing. Designers use lace to create delicate detailing and intricate embellishments that make their gowns truly one-of-a-kind. If you’re wanting to make a statement while keeping your wedding dress silhouette simple and uncomplicated, try lace. The type of lace is usually named after the place the pattern originates from (e.g. Chantilly lace). Rembo Styling use lace to beautiful effect in their gorgeous low-back wedding gowns. Designers use beads and sequins in combination with lighter fabrics like tulle, chiffon and stretched satin so the beading drops beautifully to your shape. Eliza Jane Howell's modern take on 1920s Great Gatsby chic features an incredibly detailed amount of beading, designed in London and hand-beaded in India. Still feeling like a befuddled bride-to-be? Make sure you check out our Style Guide blog for answers to more wedding dress FAQs! Time to show off your organza eleganza?